A one-day “bioblitz” conducted this month shows the value of DNA barcoding developed at the University of Guelph for identifying living things quickly and easily, according to a paper co-authored by more than 100 scientists worldwide. Scientists from 17 countries collected and processed thousands of specimens, analyzed their DNA barcode sequence to assign taxonomy, and wrote and submitted the paper for publication – all in less than a week. The day-long bioblitz yielded about 3,500 specimens of living things, including animals, plants, fungi and lichens, says the paper set to be published next week in the Biodiversity Data Journal. Many U of G researchers are among the authors. “This shows the speed at which barcode-assisted inventories can be completed, and the utility that barcoding provides in minimizing and guiding valuable taxonomic specialist time,” said Angela Telfer, data management lead for the bio-inventory and collections unit at the U of G-based Biodiversity Institute of Ontario (BIO) and one of the study’s authors. Even with the best identification keys and experts on hand, identifying the species using traditional morphological methods would have taken “orders of magnitude more time to complete,” added Connor Warne, a technician in BIO’s Bio-Inventory and Collections unit and another study author. “A huge advantage of biodiversity surveys like this, where DNA barcoding is used, is the rapid sorting of what species you have encountered,” he said. The bioblitz was conducted during the 6th International Barcode of Life conference held atU of G earlier this month. “We wanted to host an event that would showcase what a great tool barcoding is to survey a natural area, and that the data can be generated and reported to the public in an accelerated fashion,” Telfer said. First proposed by U of G integrative biologist Prof. Paul Hebert, DNA barcoding allows biologists to use a standard region of genetic material to identify animal and plant species quickly and easily. 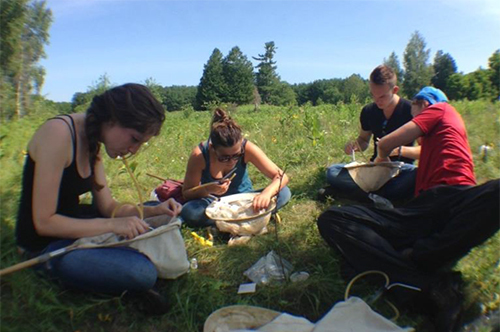 The bioblitz took place at the rare Charitable Research Reserve in Cambridge, Ont. The 900+ acre reserve includes wetlands, reclaimed agricultural lands, floodplains, limestone cliffs and old-growth forests. The new paper also includes the results of an earlier four-month survey of the reserve that yielded more than 25,000 barcoded specimens. Together, both surveys added approximately 1,100 species of animals, plants, fungi and lichens – including 181 species of spiders alone – to increase the inventory of species catalogued from the reserve by 49 percent. “It’s really impressive what a team of people were able to accomplish in a week’s time,” said Telfer.